Celebrate the joy and romance of Christmas in New England. Clare expects to take it slow with her new life. Then she meets Logan Farrell, a Boston ER doctor in town to help his elderly grandmother settle into assisted living. Slow isn’t a word Logan seems to understand. 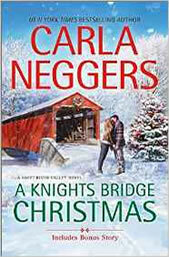 Accustomed to his fast-paced city life, he doesn’t plan to stay in Knights Bridge for long. But Daisy Farrell has other ideas and enlists her grandson to decorate her house on the village green one last time. Logan looks to Clare for help. She can go through Daisy’s book collection and help him decorate while she’s at it. As Clare and Logan get his grandmother’s house ready for the holidays, what neither of them expects to find is an attraction to each other. Better than most, they know all the crazy things that can happen in life, but everything about Knights Bridge and this magical season invites them to open themselves to new possibilities…and new love. *The paperback print edition includes “Christmas at Carriage Hill” as a bonus story; it’s also available on its own as an eNovella.